Meadow on high: Back in 2004, Oudolf was charged with “illustrating a series of moods, capturing open woodland, prairieand meadow” in one of the densest — yet most underutilized — spots in the city. Today, the famed Dutch horticulturalist’s 1¹/₂-mile-long plantings on the High Line provide a giraffe’s-eye view onto the Hudson and West Chelsea. The breezy, carefree space is enough to inspire even the most jaded New Yorker. Signature style: Holland-based Oudolf is leading the “New Perennial movement, ” which uses herbaceous perennials and grasses to invoke a naturalistic look. He has said his gardens have come to embody “more emotion, complexity, depth, drama and coherence” over the years. Practicing in New York since 2003, he was one of the first designers to introduce large-scale perennial plantings into public places. Aesthetic ID: Oudolf turns to nature, art and time for inspiration for his residential and public designs, including a 14-acre Nantucket property, a private garden in West Cork, Ireland, and roof terraces for the Huys condominium project in Midtown. Garden lab: A noted brownstone garden specialist, Drake deals with challenges such as light, circulation, and moisture. “I need to be very strategic, you can’t grow everything in [brownstone] backyards.” Drake toils in the garden of her own Brooklyn home, where she launched her company, dlandstudio Architecture + Landscape Architecture, in 2005. Beyond private homes, Drake has also planned public parks. Rockaways escape: Drake recently redeveloped a plant and grass garden for a weekend home in the Rockaways damaged by Hurricane Sandy. Farm girl: Drake grew up on a Vermont farm and her pastoralroots have made her suited to giving a “prairie farm landscape” aesthetic to her urban commissions. Claim to fame: Miami-based Jungles is best known for his lush landscapes at hotels and condos including Miami’s Soho Beach House along with the eye-catching Herzog & de Meuron-designed parking garage at 1111 Lincoln Road on South Beach. Jungles worked with the Swiss duo to create a pedestrian plaza with “an Everglades-inspired environment” via Florida cypress and apple trees and bubbling pools. Up next: Miami-wide marquee projects include Nobu at the Eden Roc (with the Rockwell Group) plus gardens and streetscapes for top-market real estate such as the Faena District (by Foster + Partners and Rem Koolhaas) and the Grove at Grand Bay in Coconut Grove (with Danish architect Bjarke Ingels). “The first priorities are generated by the scale of the space and what the function of that space will be. Space dictates the planting ratio, ” Jungles says. Water is key: Liquid is an integral part of Jungles’ gardens, creating a calm moment and introducing sound. Water can also bring birds, fish and even turtles to add a whole new dimension to gardens. Architecture roots: After graduating from Harvard’s Graduate School of Design in landscape architecture, Farris worked for a slew of New York firms including M. Paul Friedberg and Partners before launching her own design firm XS Space in Brooklyn in 2005. Today, Farris designs rooftop gardens and courtyards for townhouses in Manhattan — along with larger projects in Rwanda and Panama. Nature in the city: Farris’ first projects included a commission by the New York City Department of Parks & Recreation with Balmori Associates to convert vacant Brooklyn lots into parks for green-starved residents. “I like bringing nature into the city in unconventional ways, ” Farris says. The Columbia Street district project, known as Urban Meadow, is used by residents for yoga, birthday parties and the Red Hook Jazz Festival. Beach bliss: Farris’s naturalistic, native, wild aesthetic can be seen best at a limestone-and-cedar Water Mill home by Khanna Schultz Architects. The wooded site — covered in a carpet of liriope — is surrounded by oak and pines and a grove of crepe myrtles. The owners’ view from large, mahogany-framed windows is of cedars, red maples, birches and beachy perennials. 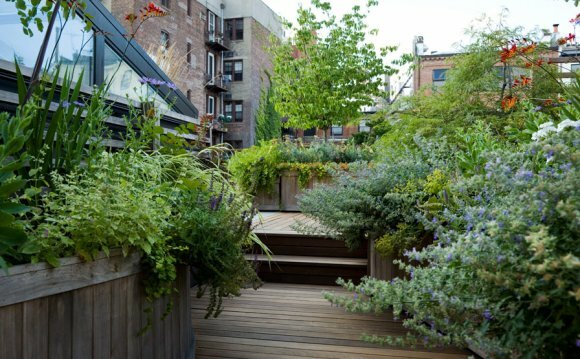 Home sweet home: Farris’s own Cobble Hill rooftop garden features a drought- and wind-tolerant plant palette. Along with a square patch of artificial grass for her children to play on, there’s a lounging and dining area accented by a pathway lined in Mexican river stones.